Sometimes I feel like I live a charmed life because I get to spend time in such charming places. Santa Barbara is one of those places. 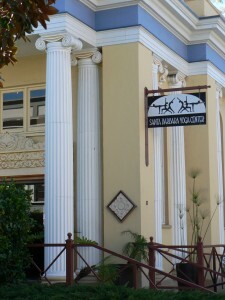 My first visit was back in 2005 and, since then, it’s become something of a second yoga home for me: Santa Barbara Yoga Center offers advanced studies and yoga teacher training, and it’s where I’ve chosen to do some of my specialized trainings — Prenatal Yoga, Kids Yoga, Yin Yoga and, this weekend, a meditation training. Each time I visit, I can count on a weekend of rejuvenation, whether I’m puddle-jumping like this past Friday night or walking along State Street in the sunshine (Sunday morning). When I’m not in the yoga room, I love exploring the shops and restaurants and, of course, taking some time to walk along the beach and smell the salt in the air. I have quite a few little favorite spots in this town, and I’m always finding someplace new when I visit to add to my list of favorites. Here’s a few to check out if you’re lucky enough to visit SB yourself anytime soon! 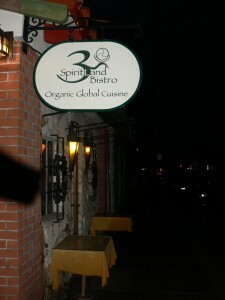 Of all the fantastic restaurants, this is the one I make sure I visit at least once anytime I’m in town. The intimate atmosphere, which always features works by local artists, is the perfect setting for a wonderful, all-organic meal. The very first time I visited in 2005, I was curious to try my first “raw” dish ever: I went with the Raw Spinach Mushroom Lasagna, and it was a marvelous gastronomical awakening! Rather than layers of pasta noodles, the lasagna is comprised of delicate slices of zucchini, layered with mushrooms, red peppers, spinach, and a raw nut ricotta. I revisited the lasagna during this trip, along with the soup of the day, which was Potato-Leek with Wild Mushroom. Insanely delicious! Slivers of mushroom added the perfect touch of texture and flavor to this soup, which was just what I needed to warm me up on such a rainy my-socks-are-wet night. For a second dinner (!) at Spiritland during my visit, I started with the Carribean Curried Sweet Potato Soup and then opted for an entree salad of mixed greens with diced roasted beets, butternut squash, and bits of vegan mozzarella. So good! Finally, a word about the service here, which is always amazing. Jord and Nitsa both were like instant old friends… and Nitsa saved the day when she double-checked for me about the ingredients in the vinaigrette that would usually come with the salad I ordered. Allergy crisis averted — thanks, Nitsa! It was in Santa Barbara that I discovered the power of reflexology, a few years ago while I was in town for my Yin Yoga training. For those of you who are unfamiliar with Yin Yoga, the practice incorporates the Taoist concept of Chi (or Qi) and, from Chinese medicine, the concept of meridians in the body that are channels of energy. So that particular weekend, it seemed fitting to schedule a reflexology session, to really tune into that energy flow in my own body. Afterwards, Michelle and I sat together with cups of tea, sharing bits of our history and experiences. I noticed the magnetic poetry on the small stainless mini-fridge in the kitchen area. You can tell quite a bit about someone by her refrigerator poetry: through love we inspire compassion; it is time for gratitude; nourish the heart to heal the soul; listen instill/ deeply/ and feel inner wisdom; laugh more; I wish to be me. And she was sweet enough to ask me if I wanted to contribute something to what was already there. Special kudos to my bed & breakfast and its staff. 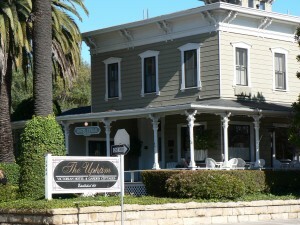 The Upham is a cozy historic inn (built in 1871), just a couple of blocks from State Street and the yoga studio. Not only was my room perfect for a quiet weekend of meditation, but I enjoyed some time in the main living room area, sitting by the fireplace — reading some of my training materials, pages of the Los Angeles Times, and reviewing my Criminal Law class notes. SO nice to sit in the warmth of the fireplace on a rainy morning, with piano music playing softly in the background and the low tones of conversations between others staying at the hotel. What really makes this place worthy of praise is how the staff went above and beyond to make me feel right at home. 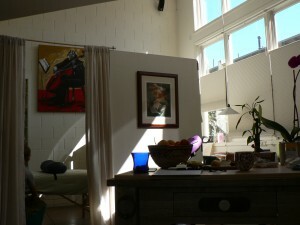 When I arrived in the late afternoon, the baking was already underway for the next day. During my welcome, the subject of breakfast came up, and I mentioned that I was vegan. No need to fuss, I assured. I’d be fine with the fruit and coffee on the breakfast buffet. But the two women in the kitchen were eager to offer some suggestions, and Alex gave me the greatest tip: the homemade granola. WOW! With a little splash of soy milk, I started off my days with a hint of heaven in a bowl. And Maureen, who I met the next morning, got all excited when she thought of a recipe for vegan cookies that she hadn’t made in a while. 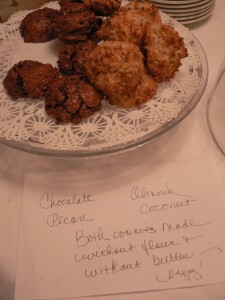 That night, I returned from my training to find on the dining table a tray of two kinds of cookies, along with a note. And plenty for everyone in the house. So thoughtful! It makes me so happy when I see others having some fun with cruelty-free alternatives; and it’s also inspiring to see how generous people can be in responding to my own choices. So, if you find your way to The Upham, be sure to ask Maureen for some of those delicious Almond-Coconut cookies she made for me and the others at the B & B this past weekend.